From the #1 New York Timesbestselling author of The Perricone Prescription and The Wrinkle Cure comes a powerful new weapon in the fight for clear and healthy skin. No matter your age, race, or gender, here's everything you need to know about acne  and how to prevent it. Long recognized as a pioneer in reversing skin damage caused by aging, boardcertified dermatologist and #1 New York Timesbestselling author Nicholas Perricone, M.D., now turns his knowledge and experience toward acne. Although often thought of as an unavoidable teenage problem, in reality millions of adults suffer from this inflammatory disease well into middle age. 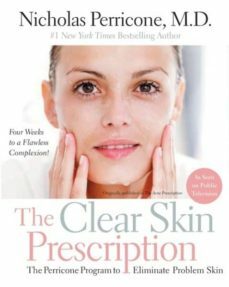 The Clear Skin Prescription delivers a complete program that incorporates Dr. Perricone's trademark threetiered approach (antiinflammatory diet, targeted acnefighting nutritional supplements, and breakthrough topical applications) that will help you clear your skin in a matter of days. Not only will you see impossibletoignore improvement in your skin, but the program will also help improve your body's overall health and appearance. Like the #1 bestseller The Perricone Prescription, The Clear Skin Prescription features dramatic beforeandafter photos, rocksolid scientific background, and a daybyday program of meals and exercise. And, Dr. Perricone dispels common medical myths regarding the causes and treatment of acne. By following the Perricone Program of diet, vitamins, topical applications and exercise, you can dramatically reduce the appearance of blemishes and breakouts and achieve a smoother, clearer complexion within three days  to look and feel better than you ever thought possible.